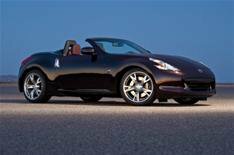 Nissan 370Z Roadster unveiled | What Car? This is Nissan's 370Z roadster, which will go on sale in the UK by early 2010. It's a straightforward drop-top version of the 370Z coupe, with an electrically powered cloth roof that raises or lowers in around 20 seconds. Nissan says that compared with its predecessor the 350Z roadster the new model's roof has a larger glass rear window, and the wind deflector behind the headrests has been optimised to reduce cabin turbulence when the top's down. The 370Z roadster is lighter than the 350Z, but Nissan says that the body is also more rigid, which should benefit the ride and handling. Extra reinforcement in the windscreen pillars and side sills compared with the coupe helps to compensate for the absence of a metal roof. Most of the interior is carried over from the coupe version, but the roadster will be available with seats that can be cooled as well as heated. A push-button starter system and an 'intelligent' key come as standard, while features such as Bluetooth connectivity, digital radio and a satellite-navigation system with a 9.3GB hard drive will be available as extras. Prices haven't been revealed yet, but we expect the premium for the soft-top over the Coupe to be around 1500, which means a starting point of around 28,500. Nissan says that UK cars will arrive by early 2010.